At the time of publishing, the Phantoms have not yet announced an official roster to begin the season. And as per usual, things change fast around here. Here’s a first look at the players the Phantoms should have available to them for the season opener tomorrow at the PPL Center. There was a time when the Phantoms were wandering. They were wandering through the league having gone seven straight seasons without even a sniff of the Calder Cup Tournament–a playoff scenario where 50% of the teams in the division, or more, make the field. It was a time when the Phan Nation was wondering. We were wondering if the Flyers organization would ever improve to the point where they could field a competitive team in their new home, the PPL Center in downtown Allentown, Pa. Rag-tag rosters of knockabout veterans and supposed prospects were fielded. Ravenous fans were snapping up orange merchandise like crazy. But let’s face it–those teams were pretty bad on the ice. Slow starts were put down to “systems.” We were told that the Phantoms were learning the new “system” and that it would take time in October and November until they’d be able to win hockey games. Meanwhile, the “machine” in Wilkes Barre could change coaches, have their roster ravaged by Pittsburgh, and still sit atop the AHL Atlantic with ease–their Calder woes notwithstanding, they were and are, always in the tournament. But as we enter year five in the Lehigh Valley-era Phantoms, the past two seasons have been different. The Flyers have brought in proven AHL players who can be experienced depth for the NHL squad, but who are well-paid to play, and play well, in the ‘A’. These guys are here on multi-year deals, know the “system” already, and are providing a solid basis for the team concept. At the same time, the Phantoms are benefiting from an influx in young talent as the Flyers organization builds depth in their development program, rather than trading away young players and draft picks. These players usually take some time to graduate from Major Juniors or NCAA programs–and just like in baseball, not all will be contributors at the top level. But the influx of these players is now paying dividends for the American League team. Goalie was all the controversy prior to training camp. Elliot and Neuvirth were signed to the NHL team, while AHL veterans Anthony Stolarz and Alex Lyon are now out of their Entry Level Contracts and on to two-way deals requiring waivers, and (mostly) precluding any assignment to ECHL Reading. The shining star from the West is top-prospect #31 Carter Hart. Already he has fans clamoring for his services in Philadelphia, but the Philly organization is resolute in their desire to have Hart refine his craft and enter professional hockey in Allentown. ECHL veteran #33 Branden Komm is on board to provide depth, has an AHL deal, but will likely be in Reading for a good portion of the season. I’m not sure where PTO player #32 Jason Kasdorf is, exactly. He is listed on the Phantoms roster at the moment. He looked good in preseason action. Now the Flyers have claimed goalie Calvin Pickard from Toronto. As with Martel in Tampa, he’ll need to remain with the NHL team for the first month or so of the season. So things are a bit muddled and we’ll have to keep watching. But as we get rolling around here, look for Elliot and Pickard to be the duo on Philly, while Hart and Stolarz will be the duo on Allentown. Neuvirth and Lyon will be on the mend. Komm and maybe Kasdorf will be in Reading. But like I said, it’s a fluid situation which depends on waivers and work visas and body parts healing. Discussion: We know these guys. This is the veteran backbone which sets the tone for the team–and they’ve all been here from at least last season, if not the one prior. One thing to watch, with the player depth in the following groups–players who are here to develop and need playing time–is that we may see a player from this group as a healthy scratch from time to time. And it likely won’t be from problems with the “veteran rule,” it will be so that young guys can get out on the ice and play games. Discussion: These are the players the Flyers have drafted, signed or otherwise acquired to restock their development system. Some are prospects, some are not. Some have been to the NHL, some are rather new. For some it’s looking towards taking the next developmental step this season, and for others it’s time to move up or move out. After that veteran core, this is the bulk of what will make the 2018-19 Phantoms a good team or a not-so-good team. Just added yesterday, Ulf’s son will add an experienced presence on the left side to support RH puck-movers Mark Friedman and Philippe Meyers. I’d have been fine with de Haas in that spot, but it’s a long season, and Samuelsson was only on a PTO out west–It was a good signing for the Phantoms to get him on an AHL deal, and I’m never going to complain about better depth. He’s an AHL veteran, of course. Zach was signed in the off-season to be an experienced player to help on the blue line. With Meyers and Friedman close to making the leap to the NHL, this was a good signing. Palmer spent last three full seasons with the Iowa Wild after graduating from the University of Minnesota. He’s from South St Paul, MN. “The Drake” was here for a bit last season, but is looking to take the next step and become a pro. He graduated last year from the University of Connecticut. Watch to see if the tall/thin defender can hold his own in the more physical AHL. David is from Illinois. German was the first-round pick by the Flyers in 2016 draft, out of Chekhov, Russia. After a short stint in the KHL, he was moved to Juniors in the Q, where he spent the last two seasons. He’s a defensively responsible center-man, but he’ll be asked to contribute to the offense as well as most first-round picks aren’t made with the idea that they’ll be bottom-six players. 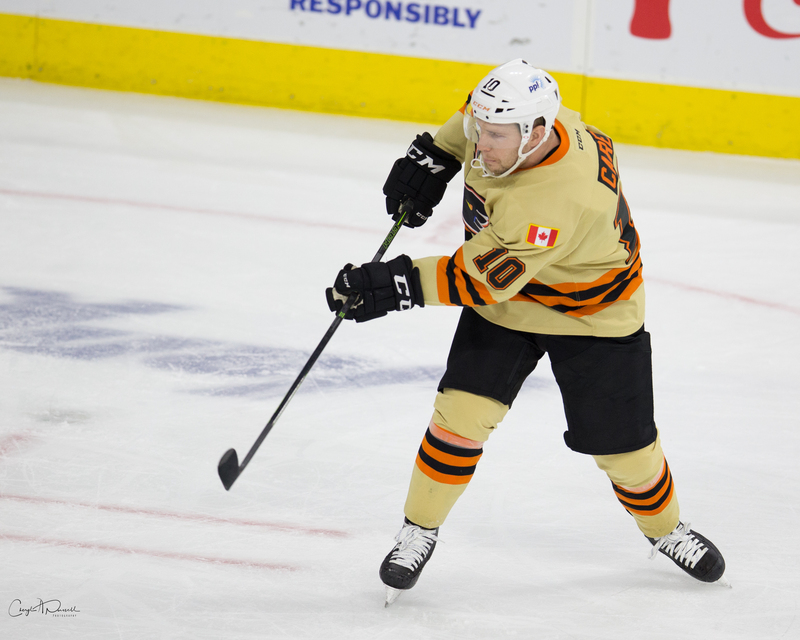 He’s not a huge dude, either, so watch to see if he’s strong on the puck in the American League, where it’s even harder to score than in the Q.
Nick joined the Phantoms for a short stint a few years back after completing his time at the University of Vermont. Save for one game last season, the West Chester, PA product has logged serious time with ECHL Reading. This season he looks to advance to the next level. The third-round winger from Calgary made a push for an NHL spot this pre-season with his stellar play. It was a pleasant surprise for the organization as the WHL veteran was always ticketed for Allentown this season. He should be a fun player to watch. The 2016 draft pick and Ontario native appeared on both the left and right wings during the presesason. He’ll need to spend some time on the wings, too, because the Phantoms are pretty stacked up the middle. The 21-yo Czech winger comes stateside for the first time after being chosen in the 5th round of the 2015 draft. He’s been paired with Rubtsov early on to help him adapt to the smaller ice surface and learn the ropes. While I don’t look for him to get off to a fast start, I am looking forward to watching him develop his game over the season, and into the next. Discussion: Weise has cleared waivers, and once the Flyers return from the west coast he could be sent the Phantoms way. As a veteran, he still doesn’t put the Phantoms over the limit. Martel was plucked off waivers by Tampa, and must remain with their NHL team for 30 days or 10 games before he can be sent to AHL Syracuse. There is a scenario where he returns next month, although it’s probably not likely. We wish him well. Our old friend Corban looked to have the NHL club made in the preseason before suffering an untimely injury. He’ll be back in a couple weeks and we’ll see if he sticks in Philly or makes his way (waivers necessary) back to Allentown. I’m going to spend more time this season looking at lines, lineups and pairings. Of course I know, Coach Gordon is likely to mix and match, and game warm-ups aren’t always indicative of who’s on the ice together. Finally, remember that the lines are not necessarily listed in the order in which they will appear or receive ice time, and that the Phantoms have enough talent to run four scoring lines and not need to sacrifice a “checking” line. Discussion: That’s almost certainly not it. But, Bardreau has been on the right when he’s not in the center. In the preseason there was a tendency to use Carey as a LW on the Varone line, but with Leier back, I think he gets the first look on a Carey line, with the youngster Bunnaman playing with the veterans Varone and Conner. Fazleev and Goulbourne are the scratches in this scenario, which seems right for the first game if everyone is healthy, but they’ll certainly play plenty of hockey. They have been using NAK on both wings lately, so that could throw a wrench in here if he ends up on the left out of the gate. I like him better on the right, but that might be just me. On D, I’m pretty solid with those pairs, unless you want to swap the RHD Meyers and Friedman for some reason based on the partner. Of course, we gotta have our Hart in the net to open things up. It’s the time of the season for optimism, obviously, but I do really like the roster. I think a blend of proven production and young talent is the way to go. The depth is so much better than it was a year ago. Other teams in the division have improved, so a repeat of the division title certainly isn’t guaranteed, but this is the kind of roster that could do it–and the coaches have proven that they can get there, too. Remember, everything above is fluid. Reading doesn’t play officially for another week or so, although they’ve got a game tonight in Glens Falls and a preseason tilt tomorrow in Reading. You could see some movement as early as later today. That’s what I’ve got–and I’ll see you at the arena tomorrow. Look for a “Hockey Night” setup column in a slightly different form, for each game this season.